Boom surrounded the Exxon Valdez as underwent preliminary repairs at its temporary home just off Naked Island, April 7, 1989. Twenty-five years ago today the Exxon-Valdez oil tanker ran aground on Bligh Reef in Prince William Sound, Alaska, causing the worst oil spill in the United States at the time. The 987-foot tanker spilled an estimated 11 million gallons, or more, of toxic crude oil into the water, which ultimately smeared over 1,300 miles of shoreline. Today, oil can still be found on the rocky beaches and some wildlife populations have not fully recovered. 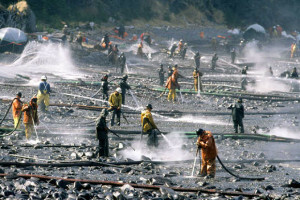 Exxon Valdez oil spill workers used pressure washers to wash oil from the beach on Smith Island, Prince William Sound. The oil was impounded in the water off of the beach and skimmed from the water. If you were to go to the beaches on Prince William Sound today, you could still find patches of oil underneath rocks and in the sand. The reason that oil continues to persist in the area is because Prince William Sound is what ecologists refer to as a closed ecological system, meaning that there is not much of a tide change and big, crashing waves do not break up the oil. Scientists that have examined this oil have been surprised to find that it has “most of the same chemical compounds as oil sampled 11 days after the initial spill.” Marine ecologist Gail Irvine says that when the oil spilled from the tanker, it mixed with seawater and formed into a goopy compound. As late as 2009 there were still more than 21,000 gallons of oil remaining from the Exxon-Valdez spill, some of which has been detected as far as 450 miles from the site of the spill. 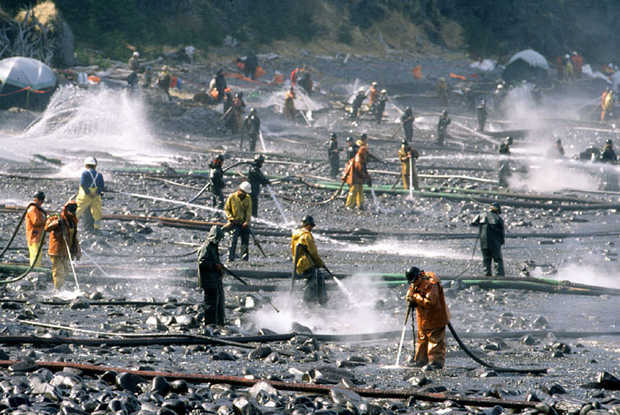 Although cleanup efforts came to a halt in 1994, oil from the Exxon-Valdez spill will remain in the environment for decades to come. 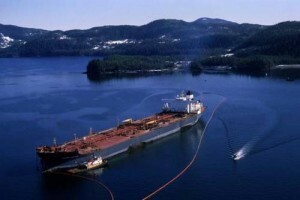 During the first year of the oil spill, The World Wildlife Fund estimated that 250,000 seabirds, 4,000 sea otters, 250 bald eagles and more than 20 orca whales died, making the 1989 Exxon-Valdez oil spill one of the most ecologically destructive spills. While most of the animal populations have bounced back in the two-and-a-half decades since the spill, some wildlife populations have not recovered. The Pacific herring population crashed after the spill, and is now listed as “not recovering.” The silvery fish is a staple food for species such as salmon, seabirds, sea otters and whales. Other species that have struggled to bounce back to pre-oil spill levels include sea otters, pigeon guillemots, killer whales and orca whales. Just two days before the 25th Anniversary of the Exxon-Valdez oil spill, “an extremely serious spill” occurred in Galveston Bay. As much as 168,000 gallons of heavy oil spilled when a barge and a ship collided near the Texas City dike on Saturday afternoon. Crews have been frantically working to clean up the spill in order to minimize lasting impacts on Galveston Bay, which is an ecologically sensitive area. Migratory birds are expected to be flying through the bay over the next month, which puts them and scores of other species at grave risk. The type of fuel that spilled into Galveston Bay is a marine fuel oil known as RMG 380, which is sticky, black and heavy. This means that unlike gasoline, which evaporates from the surface of the water, much of this oil will sink and mix into the sediment, resulting in subsurface tarballs or tarmats which may persist in the environment for months or years to come. These tragedies highlight the importance of ending our dependence on fossil fuels. The negative impacts will be with us long after the benefits have been left behind. These tragedy highlights the importance of ending our dependence on fossil fuels. The negative impacts will be with us long after the benefits have been left behind.